President Donald Trump told the American people late Friday that a retaliatory strike against Syria for its chemical attacks against civilians was underway, and would be part of a sustained response against the Assad regime. “A combined operation ... is now underway,” Trump said at the White House, saying the operation involved the militaries of France, the U.S. and Britain. Secretary of Defense Jim Mattis briefed reporters late Friday about allied airstrikes in Syria, explaining why they were conducted. 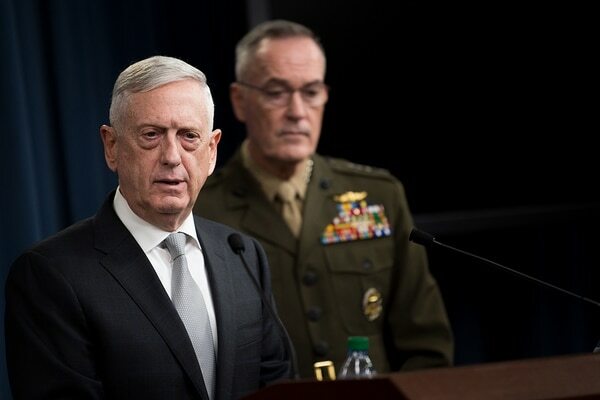 At a 10 p.m. televised Pentagon briefing, Defense Secretary Jim Mattis and Gen. Joseph Dunford, chairman of the Joint Chiefs of Staff, said the attack involved naval assets and manned aircraft. They would not name ships or aircraft, but said they struck three targets: a scientific research center in Damascus, a chemical weapons storage facility west of Homs and a storage facility and command post near Homs. Mattis said that while there would be continued pressure on Syrian President Bashar Assad, there would not be another round of strikes ― as long as Assad does not use chemical weapons again. “Right now this is a one-time shot,” Mattis said. Mattis and Dunford also said that there were no reports at this time of U.S. or allied losses, but that Syrian air defenses did engage. Dunford said it was too early to determine if U.S. warplanes or cruise missiles fired on Syrian air defenses once they engaged. The chemical attacks on Syria’s women and children have affected Trump in a way that other war atrocities that have occurred during his term have not. The president tweeted early Sunday, just hours after the most recent April 7 attack took place. Trump did the same a year ago, when similar images of murdered children, frozen in poses that suggested they struggle to breathe in their final moments of life, spurred an enraged response. Compared to the U.S. response a year ago, this time, the U.S. took more time and engaged allies before launching a retaliatory strike. Mattis said he became convinced on Thursday, after his testimony before Congress, that a chemical attack took place. The difference in the two responses showed the desire by the U.S. to act in concert with its allies this time, and also reflected a strong desire by the U.S. to have a measured response that did not cause more civilian suffering and did not risk escalation with Russia. “This is not about intervening in a civil war. It is not about regime change,” May said. Trump said the action was prompted by "a significant escalation in a pattern of chemical weapons use by that very terrible regime." But there was more firepower this time, Mattis said. In the 2017 strike, 59 Tomahawk cruise missiles were fired. The line has been in regular use this week, said Pentagon spokesman Eric Pahon. The line is used by both sides to identify troop locations in order to avoid hitting each others’ forces or incur mid-air collisions or miscalculations. Russian jets, radars and ground forces are there to support Assad, who has been in a now seven-year civil war with many of the partner forces the U.S. is working with in the fight against the Islamic State. In the last year, the deconfliction line was used the three times that U.S. jets shot down aircraft threatening U.S. or partnered ground forces, including two Iranian drones that were threatening U.S. troop positions in southern Syria and a Syrian fighter jet that was threatening partnered forces. The defense secretary said use of chemical weapons against civilians is "beyond the pale" and needs an appropriate response from U.S. leaders. It was used in the last week to communicate that “we do not seek conflict with the Russians or the regime,” Pahon said. 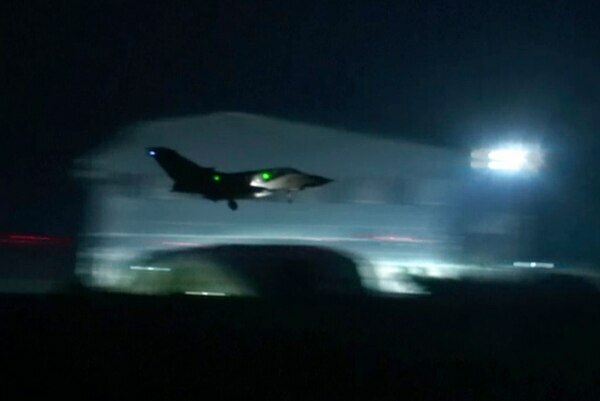 Friday night’s retaliatory strike took place after a week of consultation with allies Britain and France, and after each country independently said it had concluded a chemical weapon was used against the civilians in Douma. “If you rush decisions like this, you make a mistake,” Nikki Haley, U.S. ambassador to the United Nations told reporters in New York Friday. In contrast, the April 2017 strikes were unilateral and were executed by U.S. warships just two and a half days after the chemical attack occurred. How is the U.S. sure these attacks will have lasting impact? Military Times Pentagon bureau chief Tara Copp asks how the U.S. is sure the strikes will be impactful--especially after the 2017 strikes. In 2017, after President Donald Trump saw images of murdered women and children from Assad’s chemical attack on the Syrian village of Khan Shaykhun, he ordered direct and swift action. Rota, Spain-based destroyers Porter and Ross were quickly re-tasked toward the coast of Syria. The two vessels raced across the Mediterranean to position themselves and at 8:40 p.m. eastern standard time April 6, they fired 59 Tomahawk cruise missiles at Shayrat Air Base, where the Syrian jets that had dropped chemical weapons on the village had originated from, according to U.S. satellite and radar tracking. The chemical was later identified as Sarin gas. Tomahawk cruise missiles are designed to fly at low altitudes and speeds up to 550 mph, giving them a strong defense against many anti-aircraft measures. The 3,500-pound explosives also contain guidance systems that can be tailored to provide further evasive capabilities. Images provided by U.S. officials after the 2017 attack showed some damage to Shayrat, including the destruction of 20 Syrian aircraft, ammunition storage sites, a surface-to-air missile defense system and fuel and ammo depots. However the runway was left intact, and the base was reported to have restarted its chemical weapons activity by June 2017. Defense News Pentagon bureau chief Aaron Mehta contributed to this report.